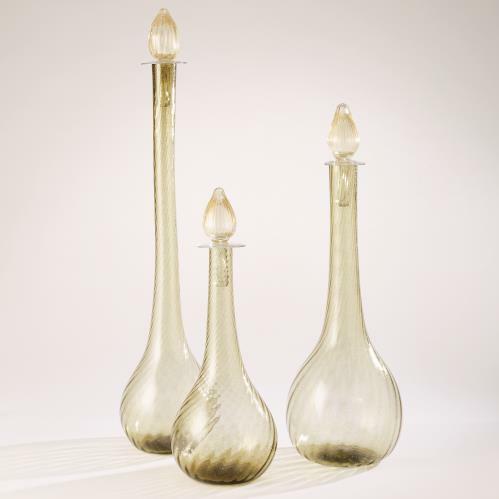 Italian glass artisans place blobs of molten glass onto their hollow pipe blowing tubes. The blobs of molten glass are then pressed into "spiral" molds. The molten blob is then blown into a larger steel mold, the shape begins to emerge from the mold with the original spiral motif in tact through the enlargement process. Hand formed stoppers are then formed and rolled through sheets of 24 kt. gold leaf giving them the glow they possess.